In true form, I've finished my monthly ALYoF goal on the last day of the month. A great big gigantic thank you to Sarah of Berry Barn Designs for her inspiration to do a little selfish sewing this month. This king size quilt top is for our bed, my largest project by far. My goal this month was to finish the quilt top by sewing at least 30 minutes a day. You can see my progress through the month: week 1, week 2, week 3, and the finish below! 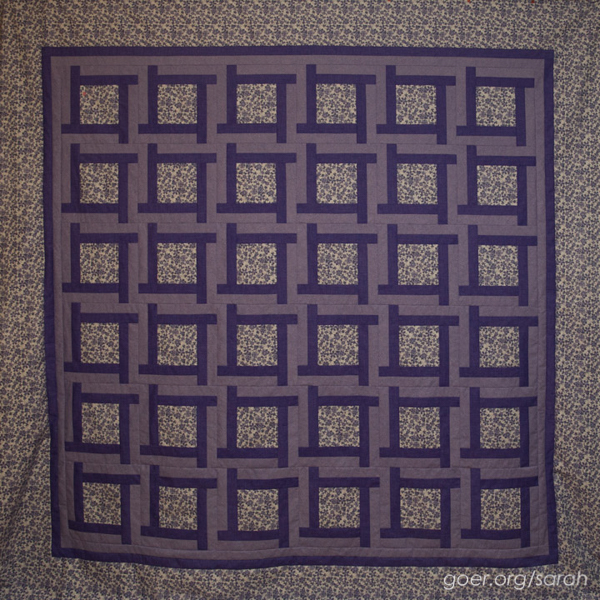 The pattern is Puzzle Box by Tracey Brookshier. 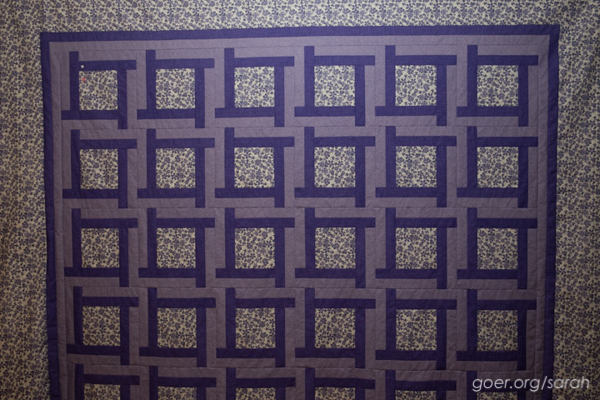 The AWESOME purple ninja fabric is by Robyriker Designs on Spoonflower. I was so appreciative to Elishka when she was willing to edit her design into the correct purples to match my bedroom wall paint. Molli Sparkles helped me find the perfect background fabric (Blueprint Basics by Valori Wells) when he was at Intrepid Thread on his visit to California. Thanks to my sister Jenn for taking these pics of the quilt. I look forward to getting it onto the bed and showing it to you in place once I send it out to be quilted and finish it up. This has certainly been an "it takes a village" kind of project and I really appreciate all the help and encouragement in getting this far. Now to figure out where to have it quilted. Any tips on finding a quilter and questions to ask a quilter are greatly appreciated, as this is my first quilt that I'll be sending out to be quilted. Linking up to 4x7 Sewing Challenge, ALYoF February finishes, and Stash Bee February Linkup. Posted in Quilting. Tags: 4x7 sewing challenge, ALYoF, Finish Along 2015, king size quilt, quilt top, sewmystash2015 on February 28, 2015 by sarah. That's a really neat pattern. I once made a king size quilt for a wedding. I tied it because I was too cheap to have it sent out to quilt and I hadn't attempted to quilt on my machine at that point. Great job getting the top done!! It's beautiful Sarah!! Good luck on finding your quilter!! 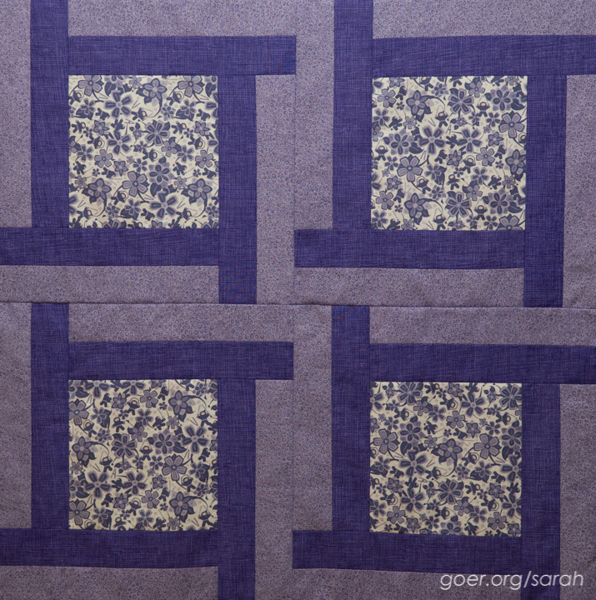 Years ago I got a recommendation from the Granary for a quilter...Ohana? I can't remember. I would talk to the folks at the Granary; they will steer you to the right folks. I think you just have to stipulate what sort of quilting pattern you want them to use. And since most of the folks who do this sort of thing have longarm machines, it will be stunning. This is great Sarah. 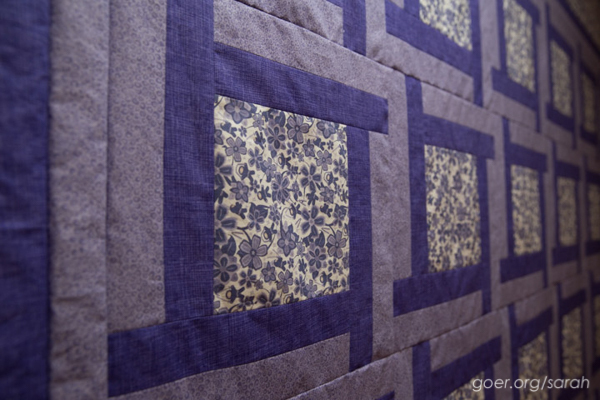 The idea of looking for a quilter at your upcoming show is a great one. You might be able to talk to a few and see their work. We do have a really good one here in Grass Valley. I have seen her work and it is gorgeous. Her name is Sandra Bruce and you can google her . I think her pricing is considered to be reasonable and she is very talented. Awesome! I bet it is even prettier in person. Ta da! You did it, Sarah! Awesome finish for the month. I'm so glad you met your goal, but perhaps doubly glad because it's the best color ever - PURPLE!! : D Thanks so much for joining me in the challenge! Awesome job on the purple finish :) I love it! And congrats on winning the 4 x 7 Challenge :) You so deserved it.